There’s an expression that has me tugging for my shirt collar, as I feel a sense of constriction around my neck, it’s the phrase ‘on trend’. 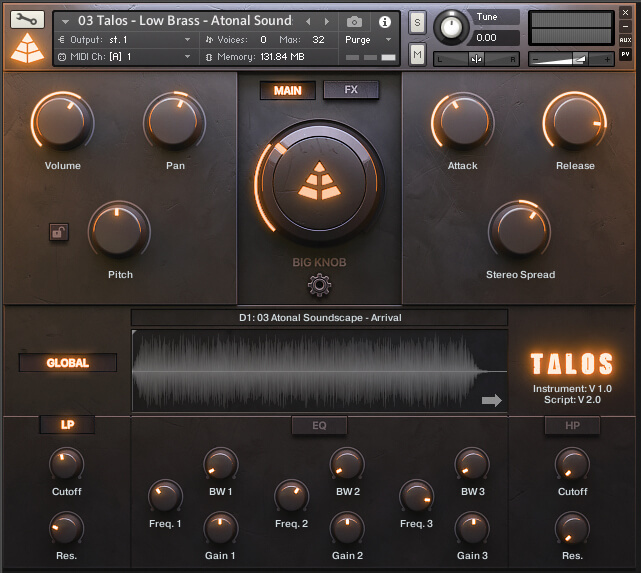 Yet cinematic scores often tend to come in waves, as one work inspires another; and there are some very clear influences on show within Audio Imperia’s new package, Talos Volume Two: Low Brass. Back in 2010, the Christopher Nolan epic Inception hit our cinema screens, featuring a score by Hans Zimmer. It’s here that we first encountered the ‘braaam’, which is that low-brass-styled effect offering enormous gravitas and volume familiar to us all, thanks to its use by practically every blockbuster filmmaker ever since. With a brass section featuring 12 trombones and four tubas, Inception’s score became something of a sonic calling card. The concept of hiring that many great low-brass players and placing them in an equally great studio might seem a daunting one, but that’s where Audio Imperia has stepped in. Based around four bass trombones, four cimbassi and four tubas, Talos Volume Two has been recorded on a relatively dry stage, to match the company’s other libraries, such as the outstanding Jaeger Essential Modern Orchestra. As well as offering a single full mix, the interface presents the option to vary the level of four separate signals, drawn from spot mic’ing, Decca tree, wide and far positions. In all cases, there’s a single Low Brass patch and no separation of instrumentation. However, there is still plenty of scope for both control of timbre and choice of articulation. Apart from the sustained articulation, there are long and short marcatos, staccato and staccatissimo and long and short crescendos which are furnished with or without flutter tongue. There are also some really great Rip and Bend patches, which offer a completely otherworldly sense of timbre. It’s really great to have stuff which is a out of the ordinary when it comes to these sorts of sounds. This is not the domain of the pleasant legato patch, so if you desire a singing tenor trombone playing dolce, then you’re in the wrong department. Examining the various keyswitches available within the default multi-patch, I found myself moving away from the full-mix setting. With a beautiful sense of immediate simplicity, the four individual mic faders can be activated and blended at will. The Decca tree, wide and far settings sound excellent, while the close-up spot mic’ing can, unsurprisingly, sound a little raspy when at volume. Being a brass player myself, I’m well acquainted with the brightness that can easily be captured, and it’s often not what you want, so the ability to limit this element easily is a real boon… but if you like it, it’s there. The one point that did become clear with patches such as the sustained articulation was a slight sense of cycling in the sample, where you could hear the loop point. It’s not overly obvious, but it is there if you know what to listen for and becomes more prominent the brighter the timbre gets. Dynamic and expression control is pretty standard, with an exceptional timbral brightness being delivered once the dynamics control is fully opened. There’s a smoothness of control here which allows you to deliver the degree of brightness needed. It has to be said that while something might feel a tad too bright and excessive in isolation, placement within a track will quite likely require the brightest elements to be present, so it’s exceptionally useful to have the option in the mix. Another option that Audio Imperia likes to engineer into its libraries is the sample start control. Back this off for a small delay to the sample start; but for greater immediacy in triggering, it’s merely a fader slide to remove the delay altogether. The extras begin with the Big Knob, which is situated in the centre of the control console and delivers plenty of saturation to the incoming signal. This can be used to great effect for creating movement in tracks, as can the keyswitched FX gates and sequences, which are triggered from the upper part of the keyboard. The rhythmic and overtly electronic feel that creeps into the sound when these are deployed can be exceptionally useful, as can the ability to control the settings within the step modulator page. 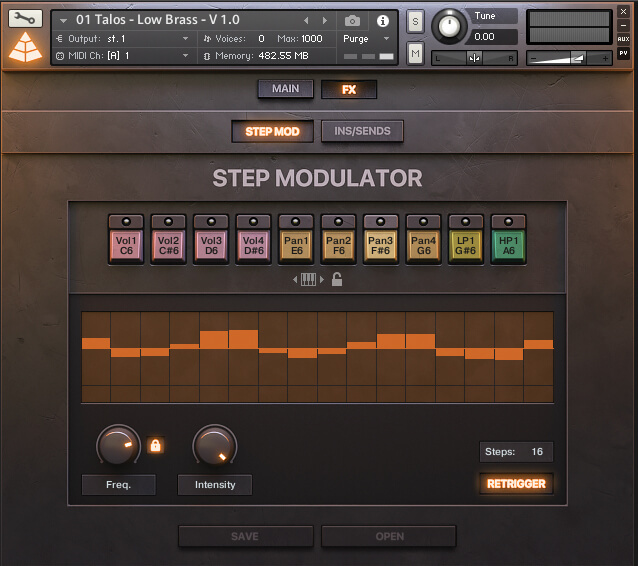 Simple gates, panning effects and filter-based pumping swells are all preset, with the ability to edit the number of steps and more besides. Further to the multi-patch, individual articulation patches are also offered. However, I found that with all four mic signals loaded, a mere 0.63GB registered as being used, making it pretty efficient. 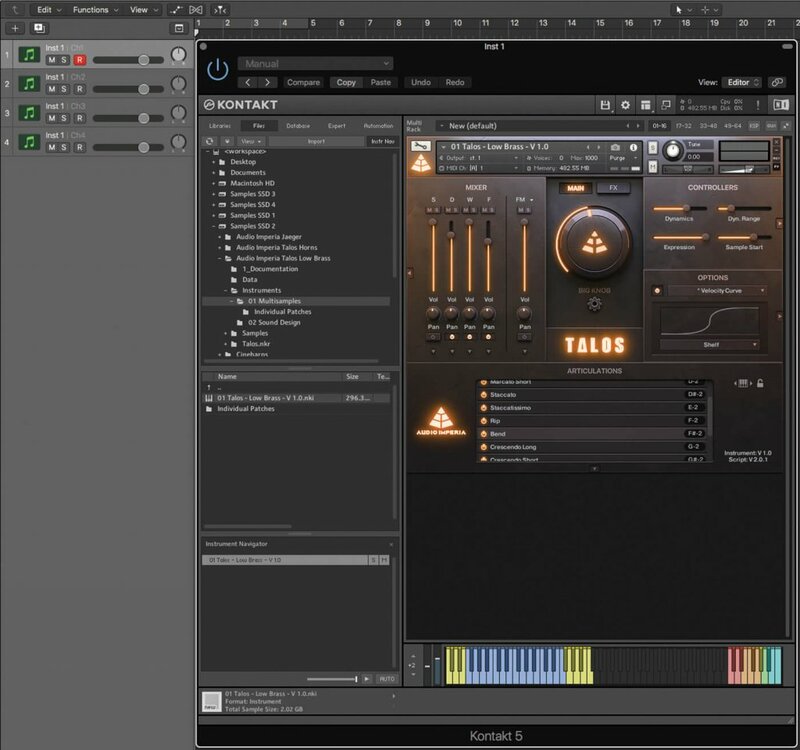 Audio Imperia has an excellent reputation for additional sound-design patches and Talos Volume Two is no exception. Five patches offer bends, drones and sound effects, along with soundscapes and textures, which are either tonally or atonally constructed. Falling firmly into the aforementioned ‘braams’ category and far beyond, each patch is sample driven, being completely derived from the original recorded content, while allowing for real-time control of high- and low-pass filtering and EQ. Without wishing to overstate how good these are, some of them could really be considered tracks in their own right, and then there’s the bottom end, which is extended in frequency and very tightly compressed. The quality of production is absolutely second to none; it’s sound design at its highest level. Given the wide nature of the frequency bandwidth available, I did need to tame some of the patches with filtering, but by adding resonance, yet more colours present themselves. What sets Talos Volume Two apart from other contenders is the way it delivers two main elements as a combined concept. It’s a low-brass library at full tilt, with a three-octave range from middle C downwards: but also offers mellow timbres, full of gravitas, which can be driven to a state of brightness and, in context, prove highly effective. You then have to consider all the additional content; the FX, gating and sound design. That all adds up to a tidy package that’s something of a bargain. If you’re in the market for some low brass, this is a worthy consideration, although its strength is firmly in the realm of sustained tones and associated other articulations. This isn’t what you might call a ‘generic’ library of brass – it’s purely low brass. The additional content is very cinematic. It can sound extreme, but that’s sort of the point… while the triggered and real-time effects elements can really assist when creating builds in your music. Equally epic, offering low brass and a lot of other instruments, Ark 1 has set a great standard for orchestral sounds at the very top of the dynamic range. It’s more expensive, but you get a lot of other orchestral instruments. Billed as offering ‘apocalyptic low end’, Albion 3 offers far more than brass, and fits in well with the rest of the Spitfire Albion range. It also offers additional loops and synthetic content – a soundtrack for the end of the world. 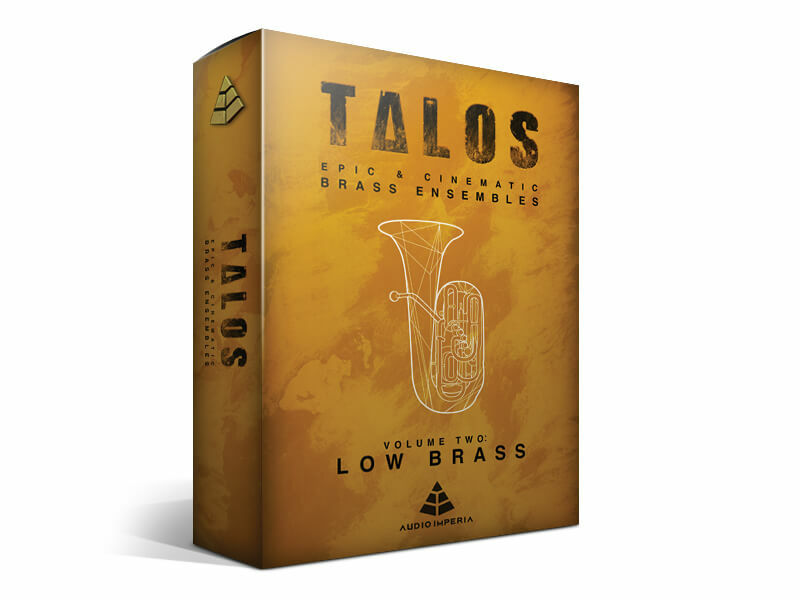 There is no doubt that Talos Volume Two packs one hell of a punch in the low-brass register, and at this price, it’s something of a no-brainer.